When it comes to choosing the right safety relay, identifying the smallest performance improvements can result in big productivity gains. That’s why SICK has developed its ReLy safety relays to achieve a 10 ms response time with a class-leading, long and durable product lifecycle. 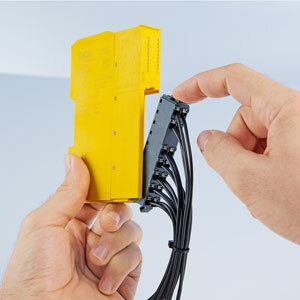 In a range of just four products, the SICK ReLy safety relays meet most needs for monitoring safety functions or safety sensors up to PL e (EN ISO 13849) and SIL3 (IEC 61508), while enabling simpler selection, installation and maintenance. “Safety relays may be an everyday device for monitoring safety sensors and switches, but identifying the best-performing product for your application can be a time-consuming and laborious process,” explains Seb Strutt SICK UK’s safety specialist. “With such a plethora of different devices on the market, we wanted to rationalise safety relay specification. The SICK ReLy safety relay more than halves the response time of comparable safety relays, thereby reducing corresponding safety distances. Even a small reduction in safety distances can result in a significant overall increase in operator productivity on a machine. The addition of a ‘reset-required’ output to the ReLy relays and on-board diagnostics via an LED status display enables easy maintenance with minimal downtime. The SICK ReLy is also capable of operating for a class-leading number of switching cycles before replacement is needed. The ReLy’s narrow 18mm-wide housing takes up minimal space in the control cabinet, with easy push-in front wiring and a one-click fit-and-release mechanism for simple set-up and quick replacement. The SICK ReLy OSSD1 is for sensors with OSSD outputs and integrated reset/EDM functions, and so is especially suited to advanced AOPD devices such as scanners and advanced light curtains. The SICK ReLy OSSD2 incudes input and output reset buttons with flashing LEDs for sensors with OSSD outputs but without reset/EDM functions such as simpler light curtain units, sensors and door interlocks. The ReLy EMSS1 provides an option for mechanical switches such as emergency stops and door switches, while the ReLy HAND1 is designed specifically for 2-hands-safety protection modules as in EN574.